"There's this whole class of animals where the neurons didn't seem to spike," says Bargmann, the Torsten N. Wiesel Professor. "So our question was: Well, what do these neurons do?" Seeking an answer, her team set out to measure the electrical behavior of C. elegans neurons—every single one of them, if necessary. While this study initiates C. elegans into the ranks of spike-producing animals, the action potentials observed in this organism were not identical to those seen elsewhere. 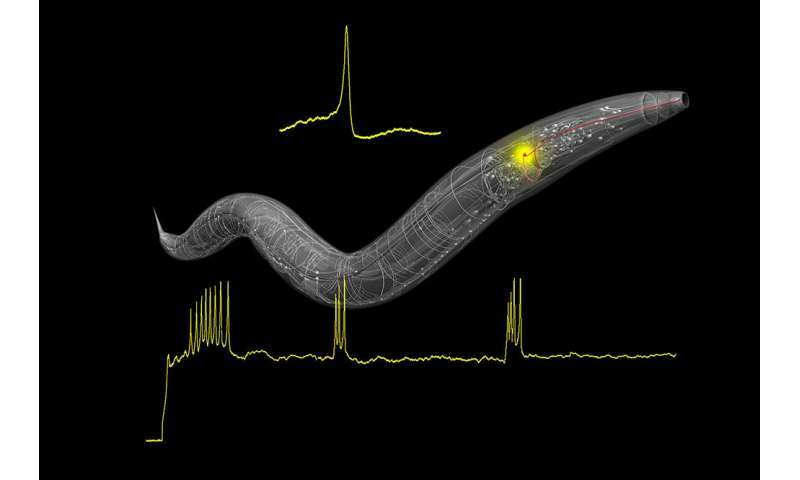 To define the characteristics of worm-specific spikes, postdoctoral associate Phil Kidd created a mathematical model of AWA's electrical dynamics—a step that, the scientists hope, will allow their research to enter into conversation with other advances in computational neuroscience. "Computation in the brain is a deep and important problem," says Bargmann. "With this study, we've shown that C. elegans can help solve this puzzle—and in fact, we've already exposed a whole new piece of it."